Samsung Galaxy Fold, the company’s first smartphone with foldable screen, has been announced at its Unpacked event in San Francisco. The phone opens up into a 7.3-inch tablet that has Infinity Flex display. It runs a customised user-interface, allowing users to transition seamlessly between the cover and main displays while using apps on the device. One can run three different apps simultaneously on the main screen. The Samsung Galaxy Fold has six cameras in total, including three at the back, two on the inside of the device and another one on the cover. The hinge is hidden for a seamless look when the tablet is folded into a phone. A fingerprint scanner on Galaxy Fold is present on the side. Samsung Galaxy Fold will be available in silver, black, green, and blue colour options. The Galaxy Fold does not come cheap as it is priced at $1980, which converts to a whopping Rs 1,40,000 approximately. Available in 128GB RAM and 512GB storage option, it will go on sale from April 26. Samsung Galaxy Fold gets a 7.3-inch screen, the company’s biggest ever display on a smartphone. 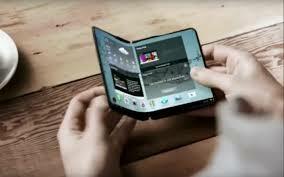 Samsung has used a new display, which it says is around 50 per cent thinner than the standard smartphone display. The new technology allows the phone to fold seamlessly. Samsung Galaxy Fold is powered by a 7nm octa-core processor and packs dual battery system. It supports Wireless PowerShare system, which allows the Galaxy Fold to charge itself and a second device simultaneously. The Galaxy Fold has a Dynamic AMOLED display and AKG with the stereo speakers. The Galaxy ecosystem with Bixby, Samsung Pay, Samsung Know, and Samsung Health is supported as well.